A Faraday cage or Faraday shield is an enclosure formed by conducting material or by a mesh of such material. Such an enclosure blocks external static and non-static electric fields. Faraday cages are named after the English scientist Michael Faraday, who invented them in 1836. A Faraday cage's operation depends on the fact that an external static electrical field causes the electric charges within the cage's conducting material to be distributed such that they cancel the field's effect in the cage's interior. This phenomenon is used, for example, to protect electronic equipment from lightning strikes and electrostatic discharges. Faraday cages cannot block static or slowly varying magnetic fields, such as the Earth's magnetic field (a compass will still work inside). To a large degree, though, they shield the interior from external electromagnetic radiation if the conductor is thick enough and any holes are significantly smaller than the wavelength of the radiation. 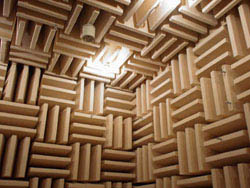 For example, certain computer forensic test procedures of electronic systems that require an environment free of electromagnetic interference can be carried out within a screen room. These rooms are spaces that are completely enclosed by one or more layers of a fine metal mesh or perforated sheet metal. The metal layers are grounded in order to dissipate any electric currents generated from external or internal electromagnetic fields, and thus they block a large amount of the electromagnetic interference. See also electromagnetic shielding. The reception or transmission of radio waves, a form of electromagnetic radiation, to or from an antenna within a Faraday cage are heavily attenuated or blocked by a Faraday cage. In 1836, Michael Faraday observed that the charge on a charged conductor resided only on its exterior and had no influence on anything enclosed within it. To demonstrate this fact, he built a room coated with metal foil and allowed high-voltage discharges from an electrostatic generator to strike the outside of the room. He used an electroscope to show that there was no electric charge present on the inside of the room's walls. Although this cage effect has been attributed to Michael Faraday, it was Benjamin Franklin in 1755 who observed the effect by lowering an uncharged cork ball suspended on a silk thread through an opening in an electrically charged metal can. In his words, "the cork was not attracted to the inside of the can as it would have been to the outside, and though it touched the bottom, yet when drawn out it was not found to be electrified (charged) by that touch, as it would have been by touching the outside. The fact is singular." Franklin had discovered the behavior of what we now refer to as a Faraday cage or shield (based on one of Faraday's famous ice pail experiments which duplicated Franklin's cork and can). An external electrical field causes the charges to rearrange, which cancels the field inside. A Faraday cage is best understood as an approximation to an ideal hollow conductor. Externally or internally applied electromagnetic fields produce forces on the charge carriers (usually electrons) within the conductor; the charges are redistributed accordingly (that is, electric currents are generated). Once the charges have rearranged so as to cancel the applied field inside, the currents stop. If a charge is placed inside an ungrounded Faraday cage, the internal face of the cage becomes charged (in the same manner described for an external charge) to prevent the existence of a field inside the body of the cage. However, this charging of the inner face re-distributes the charges in the body of the cage. This charges the outer face of the cage with a charge equal in sign and magnitude to the one placed inside the cage. Since the internal charge and the inner face cancel each other out, the spread of charges on the outer face is not affected by the position of the internal charge inside the cage. So for all intents and purposes, the cage generates the same DC electric field that it would generate if it were simply affected by the charge placed inside. The same is not true for electromagnetic waves. If the cage is grounded, the excess charges will go to the ground instead of the outer face, so the inner face and the inner charge will cancel each other out and the rest of the cage will retain a neutral charge. Effectiveness of shielding of a static electric field depends upon the geometry of the conductive material. In the case of a nonlinear varying electric field, and hence an accompanying varying magnetic field, the faster the variations are (i.e., the higher the frequencies), the better the material resists penetration, but on the other hand, the better it passes through a mesh of given size. In this case the shielding also depends on the electrical conductivity of the conductive materials used in the cages, as well as their thicknesses. Elevators and other rooms with metallic conducting frames famously simulate a Faraday cage effect, leading to a loss of signal and "dead zones" for users of cellular phones, radios, and other electronic devices that require electromagnetic external signals. Small, physical Faraday cages are used by electronics engineers during testing to simulate such an environment in order to make sure that the device gracefully handles these conditions. The shield of a screened cable, such as USB cables or the coaxial cable used for cable television, protects the internal conductors from external electrical noise and prevents the RF signals from leaking out. A booster bag (shopping bag lined with aluminium foil) acts as a Faraday cage. 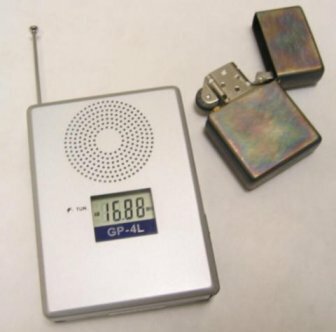 It is often used by shoplifters to steal RFID-tagged items. Plastic bags are included with electronic toll collection devices which are impregnated with metal to allow motorists to place them in the bag so that a toll charge is not registered or a device will not register a charge while being shipped to a customer's home after ordering in a delivery truck. Some electrical linemen wear Faraday suits, which allow them to work on live, high voltage power lines without risk of electrocution. The suit prevents electrical current from flowing through the body, and has no theoretical voltage limit. Linemen have successfully worked even the highest voltage (Kazakhstan's Ekibastuz–Kokshetau line 1150 kV) lines safely. 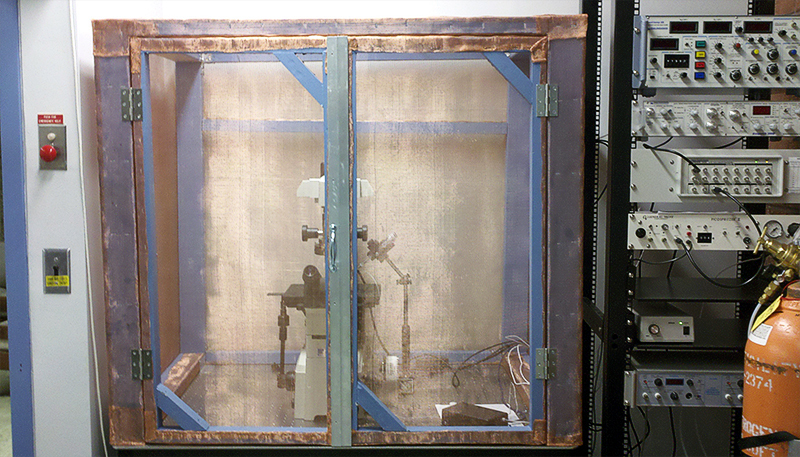 The scan room of a Magnetic Resonance Imaging (MRI) machine is designed as a Faraday cage. This prevents external RF (radio frequency) signals from being added to data collected from the patient, which would affect the resulting image. Radiographers are trained to identify the characteristic artifacts created on images should the Faraday cage be damaged. Faraday cages are routinely used in analytical chemistry to reduce noise while making sensitive measurements. A home-made Faraday cage used for simultaneous microscopy and electrochemistry is shown to the right. ^ "Faraday, Michael - ninemsn Encarta". Archived from the original on 31 October 2009. http://www.webcitation.org/5kwc3quLs. Retrieved 20 November 2008. ^ Hamill, Sean (22 December 2008). "As Economy Dips, Arrests for Shoplifting Soar". The New York Times. http://www.nytimes.com/2008/12/23/us/23shoplift.html. Retrieved 12 August 2009. Top Gear's Richard Hammond is protected from 600,000 V by a car (a Faraday Cage). 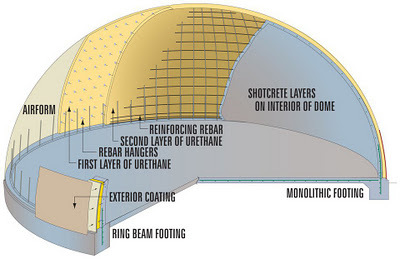 Metal cladding can make just about any structure proofed against EMP.For good resistance at a reasonable price' I'd suggest a layer of grounded stucco lathe in the outer chain shell layer.That would form a faraday cage and deflect the EMP in many directions,lessening it's effect considerably. The Federal Energy Regulatory Commission is pushing Congress for authority to require power companies to take protective steps, which could include building metal shields around sensitive computer equipment. An expert panel that Congress created to study such an attack says it would halt banking, transportation, food, water and emergency services and "might result in defeat of our military forces." "The consequences would be catastrophic," said Joseph McClelland, director of the energy commission's Office of Electric Reliability. "It would bring down the whole grid and cost between $1 trillion and $2 trillion" to repair, said Rep. Roscoe Bartlett, R-Md. Full recovery could take up to 10 years, he said. The scenario involves a phenomenon called an "electromagnetic pulse," or EMP, which is essentially a huge energy wave strong enough to knock out systems that control electricity flow across the country. A nuclear explosion 25 to 250 miles above the Earth's surface would be high enough that the blast wouldn't damage buildings or spread a lethal radioactive cloud. Even so, at that height, the pulse would fan out hundreds of miles. Electronic circuits -- integrated circuits such as will be incorporated into any "smart grid" -- are most vulnerable. Any modern automobiles with electronic ignition that are not shielded, will be vulnerable. Needless to say, any modern airplanes or airliners caught in the sky by an EMP would most likely be doomed. The political leadership of the US is focused on symbolic reforms of the auto industry, the energy industry, health care, and other things community organisers might focus upon. The real and potentially serious problems of the US quasi-empire and international peacekeeper, are essentially ignored. Unfortunately, most other advanced nations are similarly plagued by blind and incompetent leadership. Which means that it is up to you. 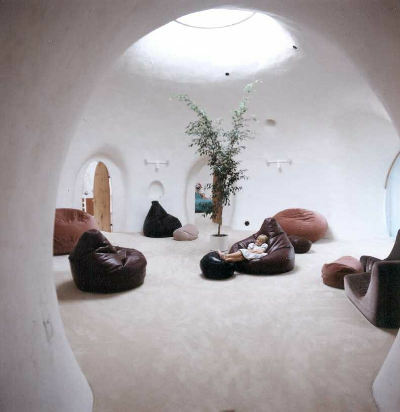 This ferrocement underground home is constructed of multiple adjoining domes, constructed on a hilltop. First a substantial quantity of earth is removed from the hilltop. 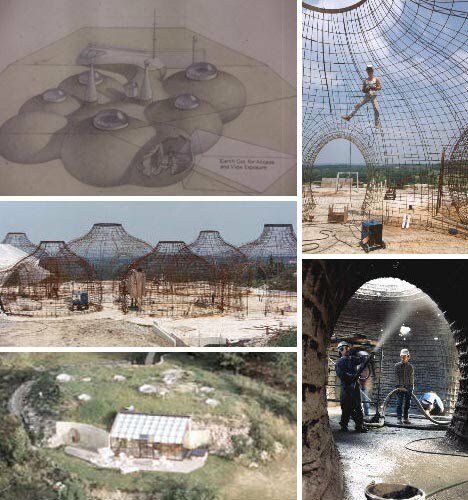 The domes are shaped out of rebar, then covered with shotcrete. Then the earth is returned to the hill -- over the now-waterproofed domes, concealing most of the structure. 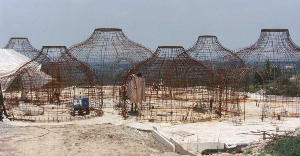 Building the dome infrastructure of rebar requires some ironworking skills, but allows for considerable creativity. The reality of needing to protect all electronic equipment against EMP from a nuclear explosion over our shores is becoming imminent. We now live in perilous times. The world is a becoming dangerous place, with China now threatening Taiwan with annihilation from hundreds of neutron bombs. Russia is modernizing their military infrastructure with an emphasis on first strike capability, they have an stretegic alliance with China, and Putin is exporting "special nuclear materials" to Iran, Syria and Egypt. President Clinton renounced "launch on attack" in favor of absorbing a first strike without retaliation, while President Bush wants "first strike" authority to attack anywhere with nukes without warning, and it is easy to see that our enemies are virtually being invited to hit us with nukes! Iran has plans to do just that! The information to follow on building "Faraday cages" is timely indeed. A single atmospheric nuclear detonation releases enough electromagnetic pulse (EMP) to equal 100,000 volts per meter (V/m). A single detonation 200 to 400 miles over the center of the continental United States would fry every unprotected computer chip from coast to coast, and from the middle of Canada to the middle of Mexico. And we are now into Solar Cycle 23, with solar flares common and expected to continue until the first of next year. CME's are capable of extreme damage to modern computerized equipment! Sure, we have our windup BayGen radio's and spare lap top computers, but unless electronic equipment is protected from an electromagnetic pulse, they will be fried! 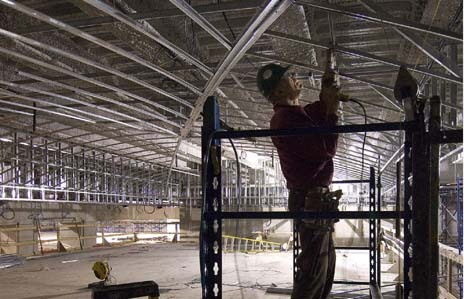 The copper mesh, like 1 inch chicken wire, worked well in large uses, like covering buildings, and it is still in use today: FEMA headquarters buildings are dome-shaped earth-bermed structures, and under the earth is a copper mesh that extends out from the base and is secured by grounding rods. As an Electro Magnetic Pulse (EMP) travels to earth, whether from a Coronal Mass Ejection (CME) or a nuclear detonation in the atmosphere, it hits and runs along electrical power lines as well, building up voltage and amperage, which is what happened during the last solar storm a dozen years ago, blowing out transformers and leaving 6 million people in eastern Canada without power for weeks. To prevent that problem, if you have a hard-wired generator, the wiring from the generator to the house should run in conduit that is grounded. The generator itself can have the frame grounded for added insurance, but that ground wire MUST be insulated and run to a different ground rod well away from the ground rod for building and conduit! See the article on EMP and various grounding techniques for electrical appliances, plus grounding metal sheds for generators. "Electric fields travel in straight lines, unless bent by other fields. Theoretically, the bottom of a cage doesn t need to be closed. If someone could offer me actual EMP test data that an open bottom is OK, I d consider believing it. However, if you re in an area of high ionization, the field could bend around. Complete enclosure is the best technical solution. Here is the tiny Survival Radio and Faraday Cage in my Survival Shop. Steel tinned EMP box, hinged lid, 4 1/4" x 3 1/8" x 1". Holds the Survival radio nice and secure. With strong, thin cardboard inside to provide insulation, the radio is protected against dust, dirt, etc, and EMP!!! Stronger and easier to make than a cardboard box covered with tinfoil. With radio's and smaller appliances, a Faraday cage can be built by using two cardboard boxes: one should fit tightly inside the other, and the item to be covered should itself fit reasonably well inside the smaller box. That is about the most work involved--finding the right size boxes! The outer box is then covered with aluminum foil or Mylar, as from a cheap "space blanket." A grounding wire is then taped to the foil. I then cover the foil with black 6 mil plastic, taped securely in place, to protect the foil from ripping. 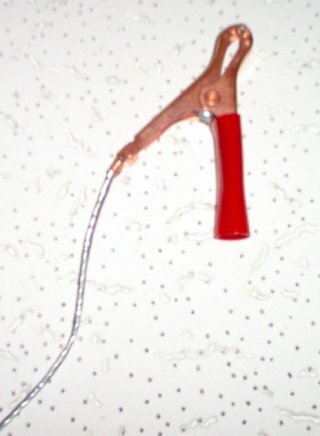 At the end of the ground wire I attach a cheap small alligator clip from Radio Shack. The item to be protected is placed inside the inner box, which acts as insulation from the outer box, and any EMP hitting the foil and is bled away by the ground wire. Some medium sized electrical equipment can also easily fit into boxes covered with foil for EMP protection. My laptop computer, for example, fits easily into a Faraday box made from a box that held reams of paper: the entire lid is removable, allowing easy access to the laptop in its case, but is safely stored when not in use. For larger items which cannot be boxed, such as living room TV sets, etc, I tape a Mylar space blanket to a piece of 6 mil black plastic sheet, using double-sticky tape every foot or so to make sure the Mylar stays in place (it is slippery). I leave a 2 inch edge of black plastic showing all around the space blanket, and while taping down the edges I put on a short lead of ground wire. When it appears that EMP or CME's are on the way, the blanket can be draped over the appliance, the alligator clip attached to a small, unobtrusive ground wire behind the cabinet, and any electromagnetic radiation will be diverted to the ground wire. Very cheap, simple, and once done, items can be "draped" for protection very quickly indeed. The "EMP Blankets" roll up for storage, but can be unrolled and thrown over a TV/VCR setup, a computer/monitor combo, etc. As EMP comes from altitude and is line of sight, it's OK that the bottom isn't covered, as the bottom of the units sit on non conductive wood. The time to build Faraday cages or blankets is NOW, as when they are actually needed it will be far too late. Each box should be labeled on the ends and the top for the exact appliance they were built for, to eliminate any confusion when they must be protected in a hurry. Any electrical appliances not in use should be stored in the Faraday cage, where they will be kept clean, neat, in a known location, and protected against any sudden EMP surge. NOTE: There are electrical engineers who say that only ferrous metal boxes will protect against EMP-enhanced weapons, while other sources say EMP is not a problem at all. I'll take the middle ground. Back, left corner of metal shed is grounded with 1/4" ground wire to a ground rod. The wooden floor of the shed is non conductive. A nuclear ground burst over 200 miles away should only result in 50,000 volts per square centimeter (sc) on your equipment, so the above Faraday cages should work. An air burst within 200 miles can result in up to 100,000 volts per sc, and that would require grounding of any Faraday cage to a separate ground rod well away from any house ground rods. 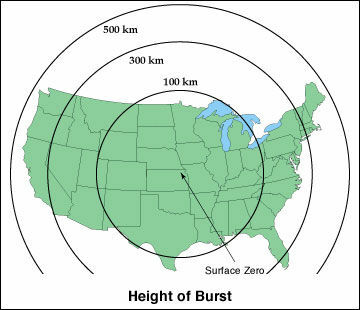 An enhanced EMP weapon exploded at 200 miles elevation can yield over 120,000 volts per sc within up to 600 miles below the detonation point, and that would definitely require insulated metal boxes which are grounded. Remember, in the battle of warhead versus armor, the warhead usually wins, as the warhead can be made bigger. However, for those who build simple Faraday cages and live in an area not likely to receive a direct or close nuclear attack, the foil cages described should work. Those under a direct or close nuclear attack would probably not survive to use their electronic equipment in any case. An atomic bomb exploded high over the center of the North American continent would damage delicate, unprotected electronic devices from the Atlantic to the Pacific, from the middle of Canada to the middle of Mexico. Iran is planning just such an attack. The word May 27, 2005 is that Iran is now equipped for an atomic weapon, news that reportedly stunned President Bush. The "possibility" has now turned into a "probability," not if, but when we get hit with a terrorist EMP bomb. It is for that reason that major US ports have, or soon will have, radiation detection equipment for scanning all inbound ships. "Project STARFISH PRIME is probably the most famous test shot in EMP lore because it burned out street lights in Hawaii at a slant range of 800 miles, but it was a high altitude detonation (about 240 miles up). STARFISH was 1.4 Mt; a larger bomb at higher altitude would reach out farther. A surprise EMP attack could well destroy all exposed electrical equipment, including generators, and leave the country in the dark for decades. The electrical infrastructure would fail, of course, but so would the banking system, virtually all transportation, the pumping of fuel, etc. In short, our country would be reduced to 1870's technology almost instantly. But individuals can prepare now, while there is still time. "EMP effects go beyond damaging equipment. They also disrupt the ionosphere severely, which affects RF propagation of several radio bands for anywhere from one hour to over a day. Projects TEAK and ORANGE (high altitude, 3.8 Mt each) disrupted a Navy VLF comm link that was 3,000 miles away at the closest point to the blasts. Building Faraday Cages; Iran plans to knock out U.S. with 1 nuclear bomb; America in the dark, Ex-CIA chief warns of EMP nuke threat, and Nations Planning an EMP Attack. As most people depend upon city water that must be pumped through electric pumps, a gravity flow water system would be a decided advantage in long term survival. My booklet, "Rainwater Collection and Storage," gives precise information on how to collect and store water for your own family without attracting attention to yourself. Even if you have taken the protective measures given below, the most likely timing of an EMP attack would be before noon on the West Coast, about 3:00 PM on the East Coast, to catch as many vehicles on the highway as possible - and while people are at work, far from their homes. The roads would be clogged with vehicles that no longer worked, families separated, and thus maximum disruption of the economy and fear instilled in the populace. Remember, an EMP attack would be a terrorist's dream, and causing maximum panic in the civilian population would factor highly into the timing of such an event. Therefore, wise people will have an evacuation plan already formulated! There are two sorts of damage that can occur as a result of an EMP pulse. The first type of damage is that caused directly to exposed transistors, diodes, and circuit boards in radios, transmitters, ignition circuits in vehicles, solar panel controllers, etc. An EMP pulse travels in a straight line, so protection is needed from an EMP from the sides and the top except if the object to be protected is sitting on a conductive surface. The second is through the accumulation of an overload of electricity on a long line, such as a power line. Faraday cages can be built to totally enclose sensitive equipment not in use. This subject is covered in more detail at this link for Faraday cages. In general, the equipment is placed in a metal or foil covered box, insulated on the inside, and preferably grounded. Exposed radios and similar equipment are extremely difficult to protect, particularly if they are plugged into a 110 volt household electric circuit. In that case, spare equipment stored in Faraday cages would be most advantageous. If the Faraday cages are sitting on a conductive surface, they should be grounded. Grounding is safer in any case, though. The second problem, long line accumulation of an EMP surge, requires isolation of equipment and proper grounding, so the EMP pulse has an easier path to earth than through the equipment. Ground rods should be driven down to wet earth, if at all possible, to provide a sufficient ground. That may mean an 8 foot ground rod, or even longer, depending upon your location. All the photos below are "thumbnails." Click on the photo to enlarge it, then use the "back" button on your browser to come back to this page. At left is an assortment of various types of ground clamps. The straps can be bolted around odd shaped or large pieced of metal. Click the picture to enlarge it. The clamp at the bottom right attaches to a water pipe. The ground clamps in the photo above cost less than $3.00 each, and are available at almost any hardware store. The package of two ground screws above cost me $2.49 at a True Value Hardware store. True Value Hardware part #GCS12SM2. At left is a 100 foot coil of steel guy wire. It can be cut to whatever length is needed with strong bolt cutters. Being flexible, it is easy to bend around corners. Steel is not as good as copper, but will work. 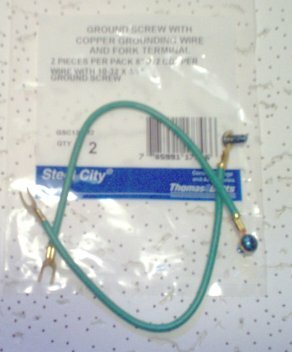 Here a ground screw is attached to a length of guy wire. A freezer or water pump can now be protected from an EMP surge. There are no guarantees that a simple ground screw will completely protect an electric motor plugged into the socket to which the ground screw is attached. Grounding electric motors is hard! But it is a very inexpensive way to help make sure that any electrical surges find an easier path to ground than through an electric motor, and thus a well pump or freezer have a chance of surviving an EMP pulse. At left is a common steel garden shed. At the back left corner I have grounded it using 1/4" ground wire: The insulated ground wire does not touch the base/floor of the shed so things inside are safe. The shed has a wooden floor, which is nonconductive. An EMP pulse hitting the metal shed would be bled off to the ground wire, so items inside should be safe. If items inside a metal shed need to be grounded, the ground wire should be insulated and go to a separate ground rod to prevent feedback! Let me explain "feedback." 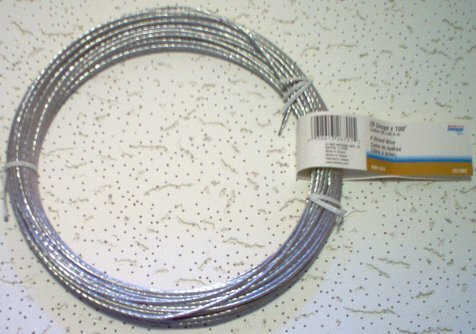 If two ground wires are attached to the same ground rod, and only one wire, say the one from a metal shed, feeds an EMP pulse to the ground, that same electricity can flow back up (feedback) the ground wire to a grounded generator inside the shed, for example, as the ground wires are effectively joined by the ground rod. 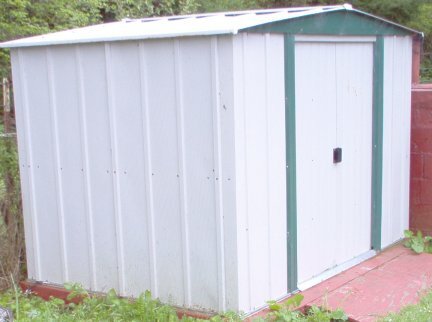 If two ground rods cannot be used, it is far better to ground the shed and not ground a generator or ATV on a nonconductive floor in the shed. A vehicle can be grounded with a chain attached to a trailer hitch or the frame. This is not an ideal ground, but should work with the voltages produced by EMP providing the chain is laying on a wet, conductive surface. This is about the only method of vehicle grounding that is truly portable. 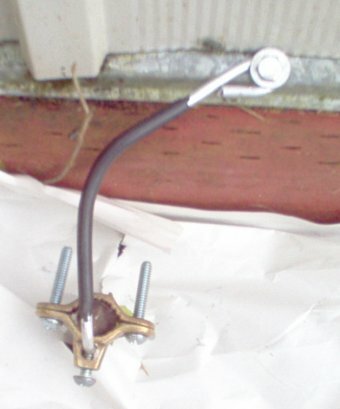 If the vehicle is stored in a garage with a dry concrete floor, it would be better to use an alligator clip clamped to the frame or trailer hitch (see below), with the ground wire shown above. The other end of the ground wire should be attached to a ground rod or water pipe. The illustration above is for grounding a vehicle that is not moving. How does one ground a moving vehicle? A dragging chain! The chain above has enough length to wrap around the front of the trailer hitch, just behind the rear axle and about 3 feet in front of the rear bumper, with about 4" of chain left to drag on the ground. It would be very hard for someone to see the dragging chain except on vehicles with lift kits. The chain simply drags along on the pavement, makes very little noise, and wears out relatively slowly. The frame and body of the vehicle are normally insulated from the ground by the rubber tires, but the dragging chain makes a good ground. I use a long enough chain so that I could make 3 loops around the front of the trailer hitch and still have 4" of chain dragging. When the chain wears down, I can remove the attachment clamp, unwrap one loop in the chain, and again have enough chain dragging to make a good ground. So, attach a ground chain and go on vacation without worrying about being stuck. This small alligator clip can be attached to bare metal on a vehicle frame or trailer hitch, while the other end of the ground cable is clamped to a ground rod. The alligator clip from NAPA (part #BEL 726142) cost only $1.99, which is cheap enough protection for a vehicle. The same clip can be used to ground Faraday cages. This is an ideal setup for grounding a vehicle in a garage. A jumper cable between the positive terminal on the battery and the glow plug buss (see arrow) will heat the glow plugs when the engine is cold. The hood is opened, the jumper cable attached, run back inside the vehicle and start the engine, then run back and yank off the jumper cable. Bingo, your diesel engine will start and run! You will want to be pretty quick when using the jumper cable. Each glow plug draws about 12 amps, so a 4 cylinder engine is drawing almost 50 amps through that 10 gauge jumper wire. Once the engine is running, you will want to pull off the jumper cable as fast as you can. As long as the engine is warm, it will start without the use of the jumper cable and glow plugs. The radio and some other electrical devices would not work, but the vehicle would run! 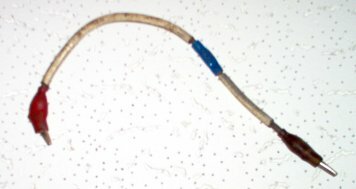 A jumper cable made using 10 gauge wire and small alligator clips on each end. I made this one in 1977 for a Diesel Rabbit. A running vehicle will be rare after an EMP attack, and you won't want yours stolen. Some people know how to "hot wire" the ignition system and may know about the jumper cable system described above. But you can fool them if you want to. Take a look at the fuel injector pump on a diesel engine. You will find a single, small electrical wire attached to the injector pump. Diesel engines will run until the fuel is shut off, so a small electro magnet pulls a shut off plug out of its socket when the ignition key is turned on. When the ignition key is turned off, electric current is off and the electro magnet releases the plug to shut off the flow of fuel to the engine. It is easy to cut the wire to the injector pump, splice in a small micro switch, run the wires through an existing hole in the firewall, and install the micro switch under the dashboard. Only you will know the switch is there. Flip off that micro switch and the engine will not get fuel, it will not start, even if the ignition switch is "hot wired." This same technique can be used on older gasoline engine vehicles with carburetors, points and a distributor that would still be running after an EMP attack. There is a small black wire running from the bottom edge of the distributor to the coil. Snip that wire, splice in a micro switch installed under the dashboard, and turn the switch off when the vehicle is parked. Even if someone "hot wires" the ignition switch, the vehicle will not start because no electricity is getting to the spark plugs! The battery would be ground down and too weak to start the vehicle, but it would still be there and still be yours! All you would need to do is charge (or replace) the battery, flip on the micro switch, and the vehicle will start...roughly, as it would have been flooded with fuel...but it would start and run again. The radio and some other electrical devices would not work, but the vehicle would run! To really confuse would-be thieves, it is possible to install another micro switch to turn off the air conditioner compressor, and it looks exactly like the micro switch to kill the engine. Only you would know the combination of "up" or "down" on the switches to turn them on or off. The pulley on the front of air conditioner motors is always being turned by a fan belt, but the compressor itself is not engaged until it is turned "on" by the switch on the dashboard...that switch energizes an electro magnet which engages a clutch and the air conditioner compressor motor will turn and work. But there is a safety device, a low pressure cut off switch, built into the back of the air conditioner receiver/drier: look for the sight glass on the vertical cylinder and you will see a wire behind it. Snip that wire, splice in a micro switch, and you can control whether or not the air conditioner clutch will engage, while the normal dashboard switch still controls the air conditioner vents and fan. In this era of high gasoline prices, that little switch can save a lot of fuel in normal driving conditions. Air conditioners can use up to 20% of available engine power. When driving up a long hill, for example, the micro switch can be flipped "off," the air conditioner compressor motor will stop working, but cold air will still blow through the normal vents, saving you precious fuel and preventing the engine from overheating while driving up steep hills. In an emergency where you could literally be "heading for the hills" with a heavily-loaded vehicle and probably pulling a trailer, this little switch could very well keep the engine from overheating and dying - the last thing you would need to happen in an emergency. If you do any of this rewiring, plan ahead and use long enough leads to the under-dash micro switches, or the engine compartment will begin to resemble a spaghetti factory. Run the wires over to the side of the engine compartment and try to make them look like normal engine wiring. Those extra wires may drive your auto mechanic nuts, but they will keep your vehicle running and safe! None of the EMP protective systems described above are expensive...they just take time and effort. And, of course, this must be done now, before an EMP attack! Several things you should have are the GP-L4 Survival Radio in a small Faraday Cage, and an LED hand pump flashlight. You may be on the road, and these items are small and portable. With the Survival Radio shown at left, you could hear news on AM, FM, or SW. Some distant radio stations would survive an EMP attack, and this little radio has excellent reception. This is the only AM, FM, SW radio that will fit in a Faraday cage (see one here) and still fit in the glove compartment in your vehicle! The GP-4L Survival Radio is available in my Survival Shop. Question. I have read in the last week about EMP one article mentioned stored fuels or ammo exploding? Answer. EMP is nothing more than a light wave with a different frequency. It would go right through ammo or fuel. The French have done testing on EMP for us for over 20 years. If ammo or gasoline exploded from EMP, every infantryman would be killed by exploding ammo strapped to his body, and everyone in a vehicle would be incinerated by exploding fuel tanks. The military would cease to exist. The government has tested for EMP effects, and soldiers still carry ammo and ride in vehicles. Question. How far into earth (dirt) the EMP would "flow"? Answer. Depends on the dirt. If it's dry, then it penetrates straight down to moist dirt. If wet, not very far. EMP is of uniform "density," not concentrated like a lightning bolt. EMP would pass right through a tree without hurting it or people standing beneath the tree, whereas lightning can kill the tree and those standing near it. Of course if EMP hit a metal building and someone was holding the ground wire in their hands, it could get real hair-raising, as then it is concentrated. If the ground wire is laying on wet dirt or a conductive surface, someone standing nearby could get fried. That is why I ran very short ground wires at the back of buildings, etc, where possible. BACK TO SURVIVAL PAGE WITH LINKS TO OTHER ARTICLES AND PLACES TO PURCHASE ITEMS NEEDED.